UNM CCC stationery featuring the new logo is now available. 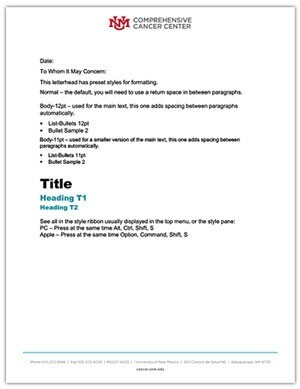 If you use electronic letterhead regularly, please fill out the template request form. If you need electronic letterhead listing leadership, please contact Julie Gipson. To order printed letterhead or envelopes, e-mail CG Printers at service@cgprinters.com to place an order. If you need letterhead for another department or division, contact the appropriate HSC logo liaison. Order by filling out a business card order form and e-mailing it to: service@cgprinters.com. Please choose the front with Health Sciences, and the back with the cancer center name. For more details, see the stationery package information online. Order giveaways, trophies and other items with logos through approved vendors. Approved vendors have the new logos for use – simply note on your order to use the UNM Comprehensive Cancer Center logo from their Learfield partnership. If you need a logo for a special use, you may be asked to attend a logo usage presentation before you can receive the UNM CCC logos. These presentations explain how we retain logo quality and usage. See upcoming training sessions. A training also will be scheduled at UNM CCC in the near future. We will keep you posted. Request a logo here. Presentation templates will be coming soon. Look for future articles in CC Notes. Current inventory should be depleted before ordering new materials. Questions? Contact Robin Johnston.